Portability with superior functionality is what Generation Z demands, which is of utmost priority in today's world. Apple iPad set off a benchmark for Tablet PC on a global scale by selling more than Tens of Million units in a single launch year. The advancement in the tablet PC market can be credited to the fact that consumers desire a gadget handier than a Laptop, more powerful than a Netbook, and more comforting than a smart phone and a Tablet PC could very well fill up all of those needs. In 2011, the global Tablet PC market reached USD 35.3 Billion, which is expected to grow further till 2016. The US Tablet PC's market is anticipated to grow at the CAGR of around 10.8% with the wide acceptance and increased demand from Enterprises. According to report “United States Tablet PC's Market Forecast & Opportunities, 2016” United States is expected to witness a phenomenal growth in its Tablet PC market. The current trends and market acceptance of the Tablet PC is rising which in consequence will help the Tablet PC market to encounter some major positive developments in the coming times. The major drivers of the Tablet PC market in terms of its characteristics will be ease of use, long battery life, mobility, ability to multi-task, instant on/off and substantial breadth of applications coupled with the long range of available prices. 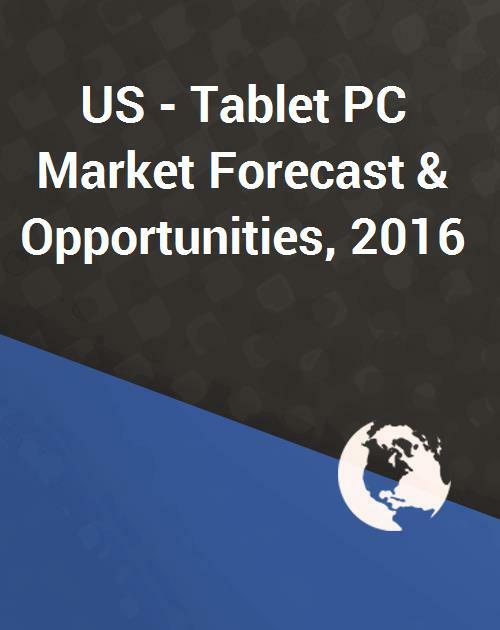 “United States Tablet PC Market Forecast & Opportunities, 2016” discusses the following aspects related to Tablet PC's in United States. - To gain an in-depth understanding of Tablet PC market in United States. - To obtain research based businesses decisions and add weight to presentations and marketing materials. - To gain competitive knowledge of leading players. - The forecasts to assess how the market is predicted to develop by 2017? - To avail 10% customization in the report without any extra charges and get the research data or trends added in the report as per your specific needs. The information contained in this report is based upon both primary and secondary sources. Primary research included interviews vendors, channel partners and consumers. Secondary research included an exhaustive search of relevant publications like newspapers, websites, and proprietary databases. c. Will Ipad Maintain its lead till 2016? d. Will enterprises boost the market for tablet PC's? While most expect the addressable Tablet PC market to be limited to consumers, at least initially, enterprise adoption of Apple's iPad has been one of the biggest surprises in the early days of the tablet market and the growth is going strong. It is estimated that in next five years the demand for Tablet PC's will increase five fold in Enterprise segment as most of Fortune 500 companies had either deployed or are piloting the device. According to recently published report by TechSci Research “United States Tablet PC Market Forecast & Opportunities, 2016” the global Tablet PC market is expected to reach USD 77.5 Billion by 2016 with a CAGR of around 35% where most of the demand would be driven by consumer market. However, U.S. Tablet PC market is forecasted to grow at a CAGR of around 25.4% till 2016 and at least 30% demand would be driven by enterprise segment in next five years. Initially, the device is expected to be used majorly by top management followed by sales & marketing staff in the enterprise segment. The developers are continuously developing applications suitable for the enterprise usage, which would make the device much more workplace friendly. However, the major concern for the enterprise segment remains the integration of multiple operating systems based devices. It is being anticipated that in next two years enterprises usage on Tablet PC's for business software's like business intelligence, reporting dashboard, CRM, etc would increase considerably. “United States Tablet PC Market Forecast & Opportunities, 2016” gives a detailed and unprejudiced overview on the Tablet PC's market in United States. The report has critically evaluated all the aspects related to computing devices market and helps the reader to get a complete overview on the latest trends and the market potential of Tablet PC's in United States. This study should be helpful for PC Vendors, Channel Partners, Application Developers, Processor Manufacturers and other stakeholders of Tablet PC industry.